If people ask you for the recipe, don't be surprised. 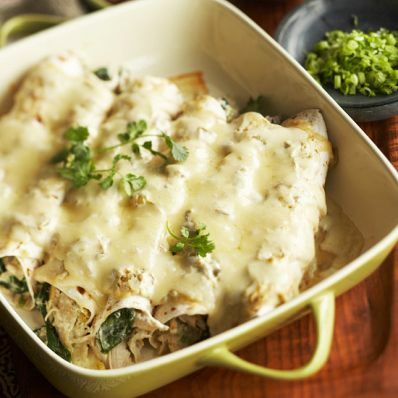 This perfect party dish features spinach and chicken dressed up with a luscious sour cream and yogurt sauce. 2 of 4 Stir in spinach, and the 1/2 cup green onions; remove heat and set aside. For sauce, stir together sour cream, yogurt, flour, salt, and cumin. Stir in milk and chile peppers. Divide sauce in half. 3 of 4 Preheat oven to 350 degrees F. For filling, combine one portion of the sauce and the chicken-spinach mixture; divide mixture into 12 portions. Place one portion of the filling near one end of a tortilla; roll up into a spiral. Place filled tortilla, seam side down, in an ungreased 3-quart rectangular baking dish. Repeat with the remaining tortillas and the remaining filling. 4 of 4 Spoon the remaining sauce over tortillas. Bake, uncovered, about 40 minutes or until heated through. Remove from oven; sprinkle with cheese. Let stand for 5 minutes before serving. If desired, serve with salsa and/or additional green onions.